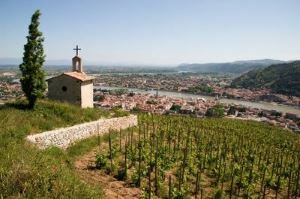 Rhône Valley wines divide quite naturally into two distinct parts, the northern and southern Rhône. 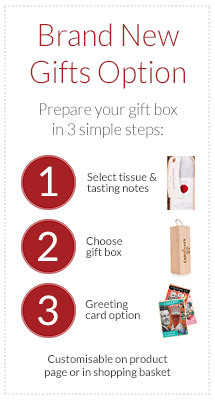 The two areas are vinous chalk and cheese. The north receives more rainfall thus making it greener, produces just 10% of the overall total and can boast the majority of the production of wines that require some ageing. Production in the south, while much higher, only rarely reaches the heights of refinement of its northern neighbour. Most vineyards of the the northern Rhône occupy east, south and south-west facing slopes on the right bank just south of the town of Vienne in the north stretching as far as Valence in the south. 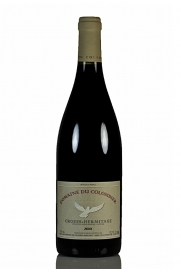 In terms of top quality wines the exception is the hill of Hermitage, on the left bank, and its more general appellation of Crozes-Hermitage. 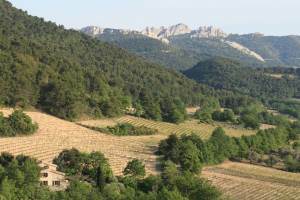 The best vineyards of the northern Rhône are terraced situated on steep, granite cliffs. One red grape variety and three white varieties dominate quality wine production. Viognier, Marsanne and Rousanne are the white grape varieties while Syrah, known in most of the world these days as Shiraz, is used to make great fine red wines such as Côte-Rôtie and the aforementioned Hermitage as well as very good wines from Cornas, Crozes-Hermitage and the best examples of St. Joseph. The vertiginous slopes of the best vineyards do not allow for much expansion, although the area under vine in the St. Joseph appellation has seen a sharp increase. Formerly comprising 240 hectares and encompassing just six communes today it extends to approximately 60 miles in length with an area of 2900 hectares covering some twenty six communes. Much of this expansion took place on the clay-based soils of the plain and these wines can lack both concentration and character. As ever the producer is of vital importance. The pioneer of modern, highly-prized and priced Côte-Rôtie, Etienne Guigal, along with the wines of Chapoutier and Chave are amongst the best examples of St. Joseph although this is by no means an exhaustive list. Many younger growers are also making excellent wines as in the other appellations of the northern Rhône , e.g. Vincent Paris in Cornas. Côte-Rôtie itself is host to possibly the most labour-intensive vineyard management in France with pulleys and even monorails necessary to move crates of grapes at harvest time down slopes whose gradient reaches sixty degrees. Work on the “roasted slope” is back-breaking but these days, thanks to such as Guigal, the value placed on these wines by the international market makes all the effort worthwhile. The power of the Syrah grape which ripens so well on the steepest slopes, especially the Côtes Brune and Blonde, is given added complexity and perfume by the addition of a small amount of the heady Viognier grape variety - usually less than 5% although the regulations actually allow for up to 20%. Fifty miles further south Hermitage Hill is planted with just 136 hectares of vines, fewer than many leading Bordeaux estates, but is famed for both its long-lived red and white wines, the latter being made from a blend of Marsanne and Rousanne grapes. Four producers dominate the production of Hermitage: Chave, Chapoutier, Jaboulet and Delas. The best wines are tough and uncompromising although highly perfumed in youth but they mature and soften gloriously for ten years and even much longer for the best wines in the greatest vintages. Last, but certainly not least, is the appellation of Condrieu along with the single vineyard appellation of Château Grillet which together make the very best examples of Viognier anywhere in the world. Wines are now made from this variety in the Languedoc as well as in California, South Africa and Australia but this formerly rare grape produces luscious wines with a heady perfume reminiscent of apricots and spring flowers from low yielding vines a few kilometers south of the town of Ampuis. Such wines are a hedonist's delight and command high prices. South of Montélimar towards the delta region the southern Rhône is home to a large number of wine communes where red wine production dominates and in which the Grenache grape plays the leading role. This grape makes big, dark wines high in alcohol but which mature quite quickly, certainly in comparison with wines made from Syrah in the north. Syrah does not perform so well in much of this sub-region but grape varieties such as Cinsault and Mourvèdre provide a useful foil to the Grenache, Mourvèdre especially relishing the heat of the south. The summers are long and very hot here and the sandy soils are a mixture of alpine limestone and alluvial clays rather than the granite of the north. Total production is huge and the quality, although varying widely, is improving as younger growers and winemakers employ modern methods driving up overall standards. Even fairly straightforward Côtes du Rhône red wines can be good, if somewhat uncomplicated, drinking. Better are those wines labelled Côtes du Rhône villages which are made in one of 17 villages all of which are located in this southern part of the Rhône valley. Some former villages or communes now boast their own appellation and good wines and value can be found amongst these. Gigondas, Rasteau and Vacqueyras are some of the best. The slopes of Mont Ventoux to the east of Orange and Avignon also produce worthwhile wines that are lighter due to the cooler conditions here as does the heavier Costières de Nîmes, the most southerly of the Rhône's appellations and located in the flat lands between Nîmes and Arles. Rosé wines are also produced in quantity of which Tavel is probably the most well-known. Despite the wide range of wines made in the southern Rhône there remains one which stands head and shoulders above all others and that wine is Châteauneuf-du-Pape. The birthplace of France's appellation system, and having the highest minimum alcohol content of any French wine at 12.5%, Châteauneuf-du-Pape is made in both red and white versions although the red comprises 90% of production. Many of the the vineyards are characterised by galets or small, round stones, which lay all around and which absorb the heat of the sun during the day to radiate it back to the grapes at night. Ripening is rarely a problem here! Thirteen different grape varieties may be grown (eighteen if the colour permutations are included) although Grenache is again dominant in the blend and include both red and white varieties. The reds are big wines with up to 14.5% alcohol by volume but rarely need more than five years to mature although the very best in top vintages may last three or four times as long. Given the availability of such a wide palette of varieties to choose from and the diverse soil combinations and micro-climates it is no surprise that the depth and flavours of Châteauneuf-du-Pape vary considerably. The most famous names include Château Fortia, Château de Beaucastel, Château Rayas, Domaine du Vieux Télégraphe and Clos des Papes but there are many more very good wines made in this appellation. Michel Chapoutier is a passionate biodynamic producer from the Rhône valley and he has produced a great example here of the white wines that Châteauneuf-du-Pape can produce. 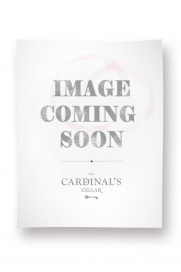 A blend of Grenache Blanc and Bourboulenc, this is a lively, fresh and medium-bodied white with a nose full of white currants, quince and apricots. In the Southern Rhone it would be virtually impossible to find a red wine as good and as reasonably priced as the Gigondas from Dominique Ay. 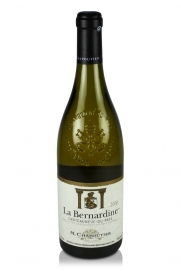 A wonderful expression of this appellation close to Châteauneuf-du-Pape in the southern Rhône. A big, hugely impressive red wine which deserves fine cuisine such as red meats and game dishes. 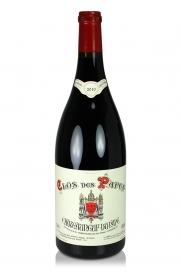 A fruity Châteauneuf-du-Pape with plenty of fleshy texture to keep the cold at bay . 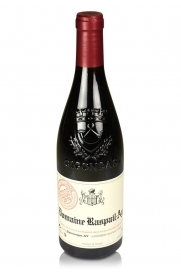 The superb 2010 Gigondas from Domaine Raspail-Ay, exhibits a dense ruby/purple colour along with notes of spring flowers, black raspberries, kirsch, crushed rocks and garrigue in a full-bodied, richly fruity, gorgeously textured and pure style. Drink it over the next 10-15 years. Another fine vintage Gigondas from this exemplary estate in the Southern Rhône.